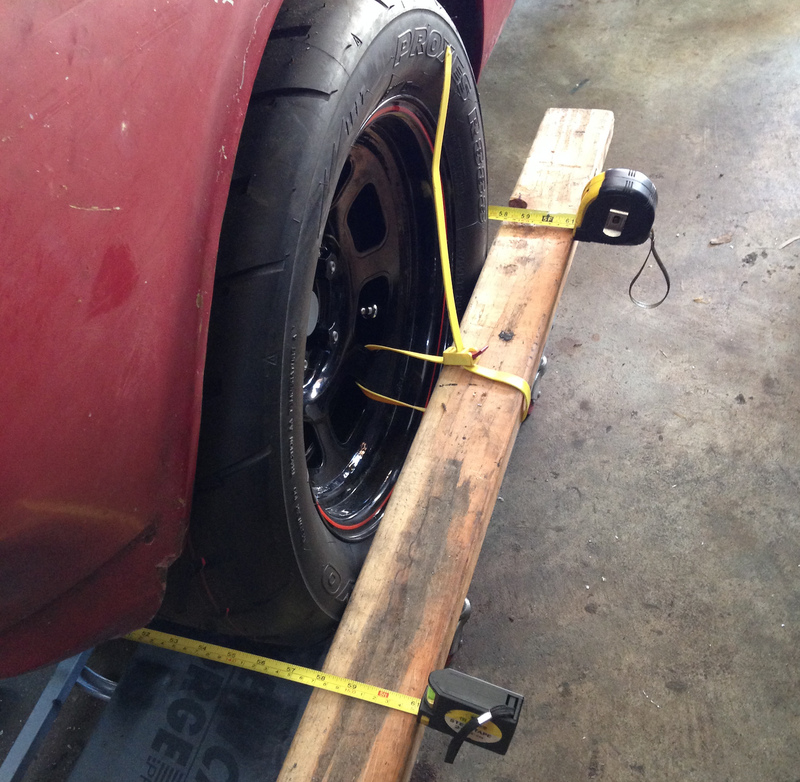 The original plan for the suspension was simple: Buy a Mazda Miata with a blown engine, take out front and rear subframes, narrow subframes as needed, weld subframes to Honda S600 frame. This would have worked out reasonably well if not for the fact that the S600 is SO MUCH NARROWER than the Miata. With the rear subframe narrowed the appropriate amount, the diff wouldn’t even fit. This lead to plan b: use the A-arms, but ditch the subframes. 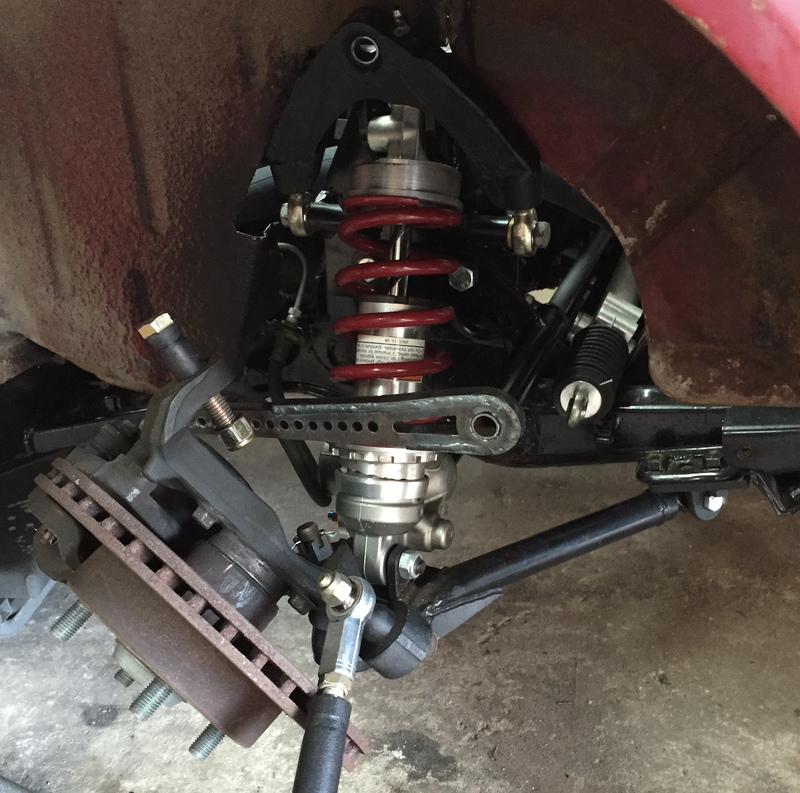 This approach required a new rear subframe to be designed and built to accept the Mazda suspension arms. Fortunately, the lower control arms were so close together that they could just use a common tube on the bottom. There wasn’t a lot of accurate jigging for this; I 3D scanned the frame (that’s why there’s white powder on the frame in the images), drew the new subframe in CAD, and then cut the tubes as closely to the CAD as I could and hope that was enough to self-jig. It worked pretty well. There were a few months between beginning this project and finishing it, and it got a little rusty in the interim. Unfortunately, the A-Arms on the Mazda were too long to use in the front, so I had to use custom arms that attached roughly to the stock pickup points on the vehicle side and to the Mazda upright on the wheel side. Both front and rear use Yamaha motorcycle shocks. The first thing people do when they get a new fancy literbike is to swap out the exhaust and rear shock. This means there are a ton of pretty decent coil over shocks on eBay right now for a fraction of what they’re worth. RC51 for scale. I miss that bike. After everything was located and welded onto the frame, I took it all apart and had the frame powder coated. I was going to sand it and paint it myself, but I remembered that I hate both sanding and painting. Alignment was done with this super expensive rig that consists of a 2×4, a creeper a big zip tie and two tape measures. Hi Matt, just curious – what type and size wheel are you using? Bassett steelies. 14×7 rear 13×6 front. Matt, I think this project is awesome. How many hours did it take? The whole car? Man, I don’t know, maybe a thousand? I did it slowly over the course of 4 years. 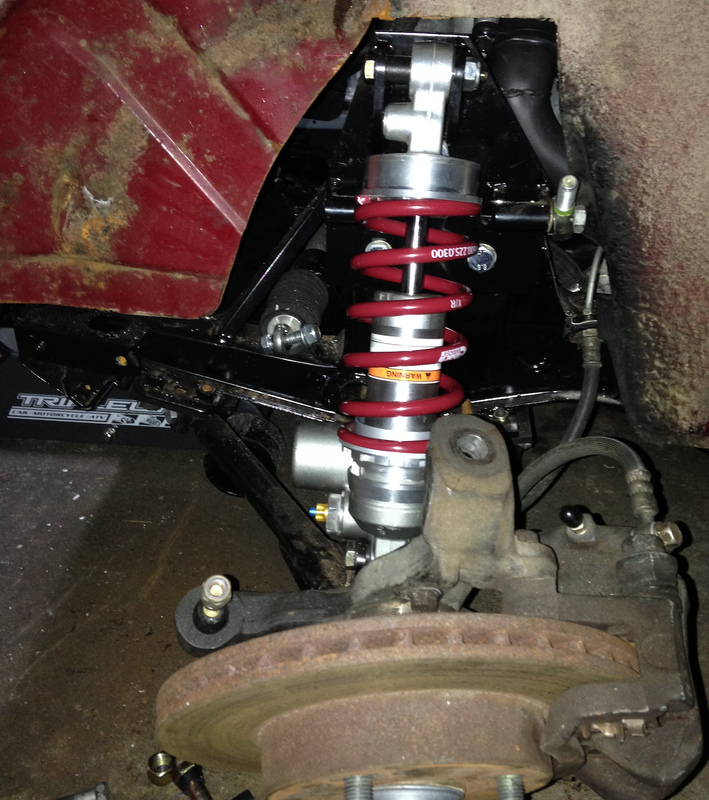 Thank you for your reply, would you be able to replicate the front end suspension setup? I would buy it from you, my S600 has a S800 chassis which has front disc brakes and live axle rear diff. Could you send cad info or any dimensional data for what you did front and rear. I would like to replicate as much of what you did with the suspension as possible. Parts list etc…even if I have to get it made. I just bought a coupe that was supposed to come with running gear from a mazda but all I have is an S800 chassis with adjustable upper arms and an empty RX7 axle housing with a 4 link…so it is going to cost as much to chase and replace to sort it out or do what you did; which is a better layout anyway and would save me alot in stuffing about trying to get dimensions right. I also have a roadster with an S2000 engine/gb which the engine fit (pan is 20mm from the road, Jag rear with issues, exhaust still a mess)…still a work in progress. Lots of stuffing about with that to and thinking I should copy your rear layout for that. what tires your running on compound and size? also how light could you make the s600 to where it would do less stress on the trans, or could you get away with running a trans cooler to help. I’m running the Toyo R888s. 225/50-14 in the rear and 185/60-13 in the front. I’m at about 1300 pounds now but you’d be hard pressed to get it significantly lighter unless you start swapping out body panels with carbon. The transmission seems fine so far; it uses the engine oil so as long as you keep the engine cool you keep the trans cool; that’s part of the reason I’m using a radiator that is “too big”. How much NOS can these engines take? I will be using a Honda Blackbird 1100cc engine on my build, do you think the factory front suspension geometry setup is good enough? I have 238mm ventilated rotors with Wilwood 4pot brakes, my car is a S600 coupe but has the S800 chassis with disc brake front and live axle rear end, so I will probably get a Toyota diff and shorten it to suit, I would like to know what you think about the front supsension setup if we are chasing around 130mph speed. Hi matt do you still have the cad file for the mx5 pick up points as that would save me a lot of time with my project. I don’t, but I got the pick up points somewhere on the internet and then drew them into CAD, so you can probably still find the dimensions online if you do some searching. Hi Matt was planning my next project car …triumph gt6 but this really grabbed my attention. Question I have is the availability of s600 project cars. Dont want to cut up running car. Second is motor. I’m looking at honda k20ish with 200 to 300 hp range. Is this even doable? Or too much motor. Under 2 litres is ok too. Thought of big bore destroke 10k rpm vtec sounds fun to me. Coupled with 5 speed. My wife ok’d a fairly large 25k budget…. I would be doing 80% of work…. can I get it built for that…the triumph looks over budget that’s why this is so attractive. I ran across a build thread a while back of someone putting a 1st gen S2000 engine in one and I seriously considered that; though you’d still have to re-do the entire drivetrain because the rear chain drive setup on the S600 is made for less than 50hp. Even with the Triumph you’d be swapping out the rear end, driveshafts, hubs, etc to something bigger, so I suspect the cost would be the same. Could probably be under 25k if you do most of the work and are frugal.